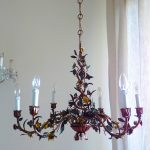 Very rare flush mount from the Italian 40s in golden brass and clear aurora borealis Swarovski. housing 5 bulbs. In very good vintage conditions, with some wear of use. Perfectly working! Installation by a professional electrician always recommended.